a plastic artist in Romania found a niche to exploit. That's how Stefania Nistoreanu enrolled on the short list of world artists who sold their works for payment in Bitcoin. The painting signed by her, created in her own workshop, reached a buyer in Hong Kong, and Stefania demonstrated that boundaries are sometimes only in our imagination. After all, the road between her easel from Brasov and the collector's home in China was just a few clicks away. "Artists are attracted to innovation, they are the avant-garde in a healthy society. Bitcoin is the beginning of a new era, and I quickly understood this, "Stefania Nistoreanu recalls the first steps she has made in the Cryptocurrency universe. She began working with BitPremier, a platform for Bitcoin transactions for luxury items. Through this, she managed to get in touch with the current recipient of the painting, originally in Hong Kong, and the artist says the experience gave her the opportunity to better understand the financial system behind Bitcoin. "At the time of sale, the painting (called" Cryptsy ") was included in the top ten best works of art in the world inspired by the Bitcoin revolution. The actual transaction happened as promised blockchain technology, almost instant and secure. It was a fantastic feeling of the new, the beginning, "recalls Stefania. She remains in touch with the Hong Kong collector who bought her painting in 2017 and says she has shown interest in acquiring other works of hers. At the time of the transaction, the painting was sold with two bitcoins, which then translated to about $ 4,500. A few months later, at the end of 2017, the same painting was worth $ 40,000, due to fluctuations that the currency had known, then reached the historic high. Meanwhile, however, the value of cryptocurrencies fell sharply, at about $ 4,000 a bitcoin. 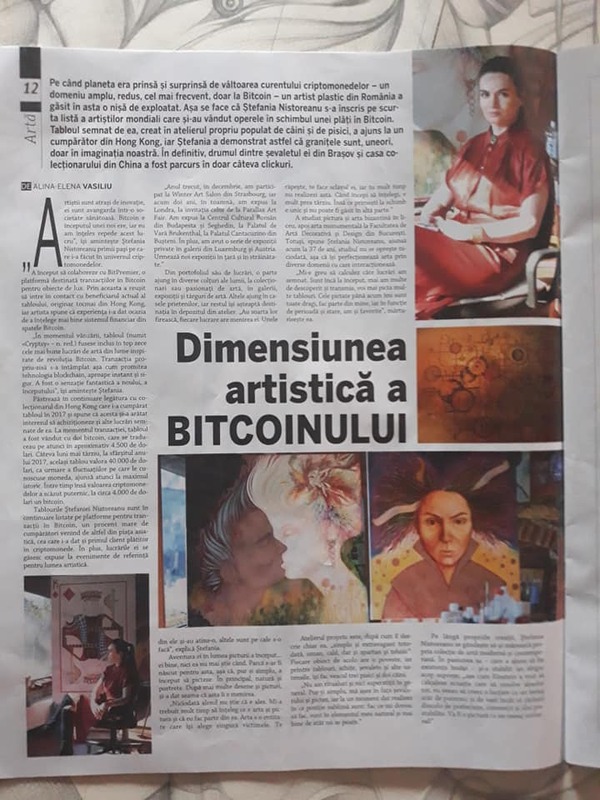 Stefania Nistoreanu's paintings are still listed on Bitcoin trading platforms, a large percentage of buyers coming from the Asian market, who also gave the first payer in cryptocurrencies. In addition, her works are exhibited at reference events for the artistic world. "Last year, in December, I attended the Winter Art Salon in Strasbourg, and two years ago in autumn, I exhibited in London at the invitation of the Parallax Art Fair. I exhibited at the Romanian Cultural Center in Budapest and Szeged, at the Brukenthal Summer Palace, at Cantacuzino Palace in Busteni. In addition, we had a series of private exhibitions in the galleries from Luxembourg and Austria. There are new exhibitions in the country and abroad. " From her work portfolio, part of it reaches various corners of the world, collectors or art lovers, in galleries, exhibitions and art fairs. Others arrive in friends' homes and the rest await their destination in the workshop storehouse. "They have their natural destiny, each work has its purpose. Some of them have touched it, others are about to do it, "explains Stefania. Her adventure in the world of painting began ... well, she does not know when. It was as if she was born for it, so she just started painting. Mainly nature and portraits. After several drawings and paintings, she realized this was her purpose. "The chosen person never knows he is chosen. It took me a long time to understand what art and painting are, and that I am part of it. Art is an entity that chooses its own victims. She kidnaps you, makes you her slave, and you do not realize that for a long time. When you start to understand, it's too late. But what you receive in exchange is unique and can not be found elsewhere. " She studied painting and Byzantine art in high school, then the monumental art at the Faculty of Decorative Art and Design in Bucharest. Still, Stefania Nistoreanu, now 37, says the study never stops, so she improves her art through the various fields she interacts with. "It's hard to calculate how many papers I signed. I'm still at the beginning, I have a lot to discover and send, I will paint many paintings. The ones painted so far are all my dear, they are part of me, and according to their time and condition, I have favorites too, "she confesses. The workshop is, as she describes it, "simple and extravagant at the same time, human, warm but also spartan and technical." Every object there has a story, and among the paintings, sketches, easels, and other utensils, they make their age three cats and two dogs. "I do not have rituals or superstitions in general. I simply sit in front of the easel and paint, and at a certain moment, I realize in what sublime position I am: doing what I want to do, I am in my natural element and better than that can not be. " Besides her own works, Stefania Nistoreanu is thinking of enlarging her own collection of modern and contemporary art. In her passion - which has come to be the very existence - she has set a single supreme goal: "as Einstein wanted to calculate the equation to solve absolutely everything, I want to create a work with such a powerful message and vast to go beyond preferences, conventions, and pre-established ideas. It will be a painting with a universal message! ". Thank you Alina-Elena Vasiliu and DA Premium ZF for this article!